Purple sweet potato is a kind of starchy sweet vegetables with loads of fiber. They are different from yam. 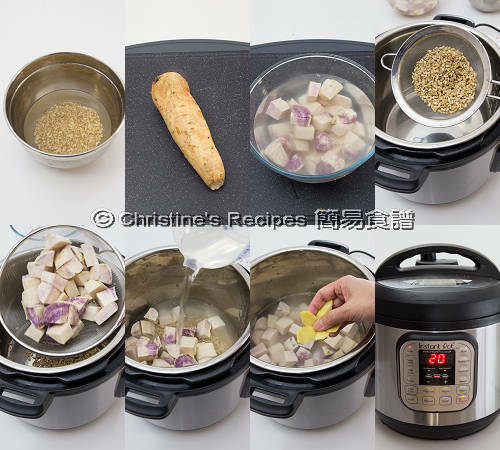 In traditional Hong Kong cooking, various kinds of sweet potatoes are widely used to make desserts to serve after dinner. 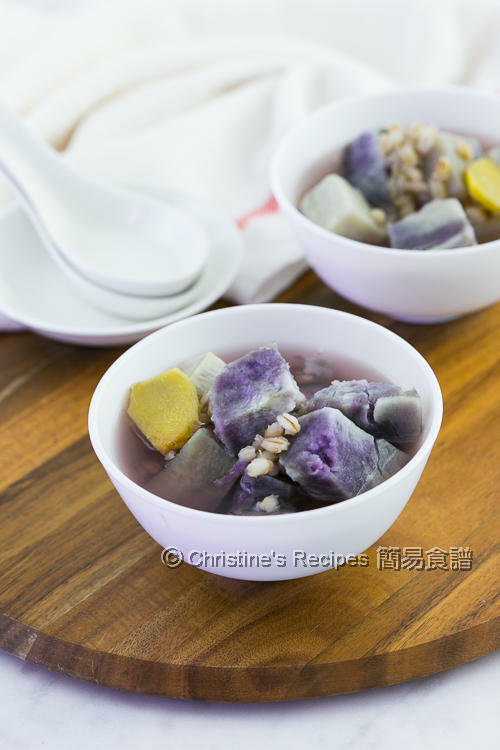 When it comes to cooking purple sweet potato, it turns soft and easily broken apart within half an hour, as a result the sweet soup will become cloudy. If you care about how the sweet soup looks like, you have to control the stove power carefully. I’ve experimented and found my Instant Pot can do the best job of keeping the purple sweet potato in good shape even they’re softened enough. If you have an Instant Pot, give it a try. If you don’t, you still can make this delicious dessert on stove. Soak pearl barley for 30 minutes. Peel and cut purple sweet potatoes into chunks. Soak in water for 10 minutes to remove the starch from outside. Drain out the pearl barley and sweet potatoes. Put all ingredients in Instant Pot. Close the lid, “sealing” position. Press “soup” button, high pressure cooking for 20 minutes. Quick release. Serve hot or warm. Enjoy! Prepare all the ingredients as above. But add extra ½ cup of water. Put all the ingredients into a large pot. Bring it to a boil over high-medium heat. Reduce heat to medium low. Continue to cook until the sweet potato pieces are softened and sugar is completely dissolved, about 30 minutes. Beware not to cook over too high heat. Otherwise the sweet potato will be broken apart and the sweet soup becomes cloudy. 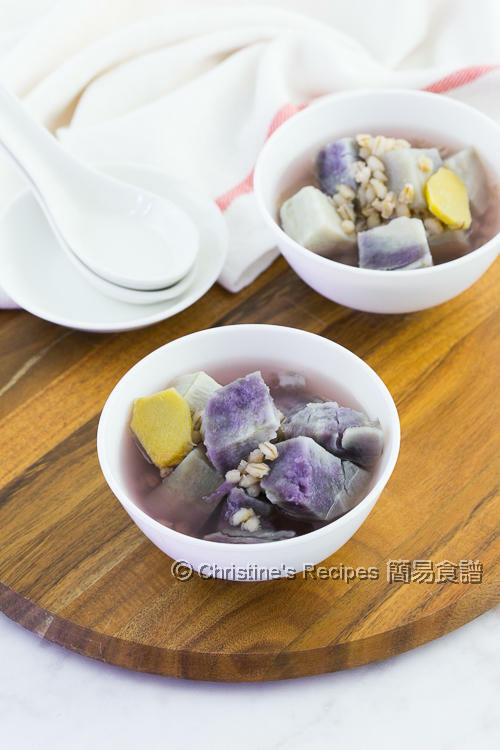 By soaking the purple sweet potato in water, the starch outside will be washed away. The sweet soup will be clear. The pearl barley needs longer cooking time than sweet potato. Soaking them in advance will help shorten the cooking time. Isn't the purple pretty? Such a wholesome soup!